Protect your bowling shoes by slipping int oa pair of these covers when leaving the lane. 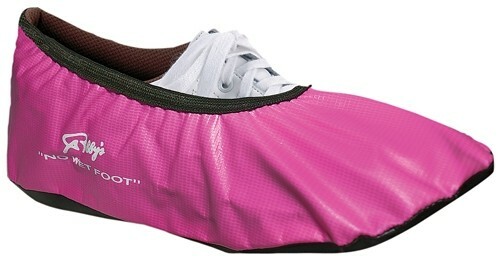 Made of high-quality vinyl with an elastic top, Robby's No Wet Foot Shoe Covers keep water, mud and dirt off your shoes. I love the color but these are the least functional covers I've ever purchased. It would be nice if they slipped on easily, but that is not the case. Takes 2 hands to get the cover on. Made the selection based on advertised shoe size. You may want to go up a size if you order. Due to the time it takes to produce the Robbys No Wet Foot Pink ball it will ship in immediately. We cannot ship this ball outside the United States.